If you enjoyed the recent iteration of Clash and Wrath of the Titans, 300 or are just in the mood for a fantastical story of love and war, then Gods of Egypt is right up your alley. In Gods of Egypt the survival of mankind hangs in the balance when Set (Gerard Butler), the merciless god of darkness, usurps Egypt's throne and plunges the prosperous empire into chaos and conflict. Hoping to save the world and rescue his true love, a defiant mortal named Bek (Brenton Thwaites) forms an unlikely alliance with the powerful god Horus (Nikolaj Coster-Waldau). Their battle against Set and his henchmen takes them into the afterlife and across the heavens for an epic confrontation. 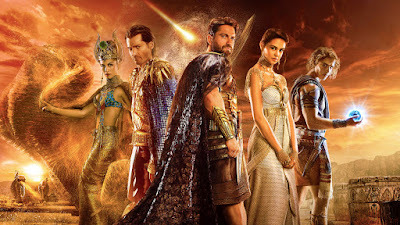 The casting for the movie is amazing: Gerard Butler (Set), Chadwick Boseman (Thot), Geoffrey Rush (Ra the Sun God), Nikolaj Coster-Waldau (Horus), Brenton Thwaities (Bek) and Elodie Yung (Hathor) give performances that are astounding. The entire cast did a beautiful job and each one deserves high praise, but I have not the time nor patience to list them all. Just know everyone involved did a fantastic job. The visual effects can seem off putting at first as each frame is saturated with content, but once you adjust you're able to drink in a world full of fantastical design and legendary mythical gods. Gods of Egypt may seem like just another action adventure story covered in CGI, but at it's core it is a story about true love and the lengths that one will go to for the one that holds their heart. Be it a god in love with a goddess or a mortal who will travel to hell and back, this movie is a genuine tale of love. Gods of Egypt is a must see if you enjoy mythical tales of gods and goddess, battles of biblical proportions and a story that anyone can relate to. As for the "whitewashing" it's a movie and none of this stuff ever happened in real life, so it is whatever the filmmaker wants, not the viewer.